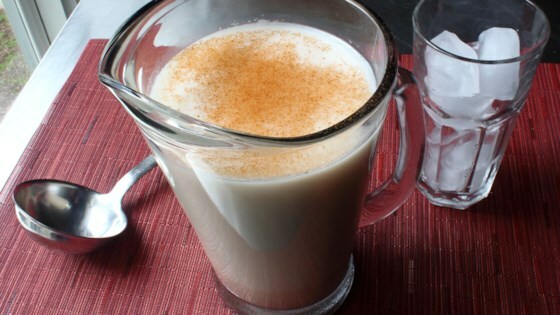 "When it comes to delicious, unique, and refreshing summer drinks, it's hard to beat horchata. We're doing a Mexican-style horchata, which is done with rice and almonds. The result is something that sort of looks like milk, but is much lighter, and pairs perfectly with all your favorite summer foods." Place rice, almonds, cinnamon stick, and sugar in a blender. Pour in about 4 cups of the water. Pulse on and off to start. Then blend on high speed until ingredients have been chopped up into very small pieces, about 30 seconds. Add the remaining 3 cups cold, fresh water. Let mixture sit at room temperature about 4 hours. (Or you can refrigerate it overnight.) Stir occasionally. Strain through several layers of cheesecloth into a pitcher. Refrigerate until chilled, about 2 hours. Serve topped with a dusting of cinnamon. A sweet, refreshing Mexican-style horchata. You can substitute 1 1/2 teaspoons ground cinnamon for the cinnamon stick. Depending on your tastes, you can alter the amount of sugar, as well as the ratio between rice and almonds, but what you can't alter is the need to strain this before serving. Unless you like gritty drinks, you'll want to pass this through a very, very five sieve, multiple layers of cheesecloth, or both. Once blended, let sit overnight before straining, if possible. This way the water has plenty of time to leach out the goodness from the rice and almonds. The four-hour method does work, but you don't get quite the same flavor. Along the same lines, many horchata "experts" actually prefer to not blend immediately, but rather let the mixture sit overnight to soften, before blending the next day. If you like how this comes out, feel free to experiment, and test for yourself. I made this just because the video made me laugh so hard. (the part about the strainer ) It was delicious! Thank you Chef John! This is very easy and wonderful. Have made this both the quick way and the overnight version. Both are the same excellent drink. Been looking for the right Horchata and this is definitely it. LOL @ the nut sack comment in the video :D Great recipe! This was great! I made it according to the recipe as written and it was perfect. Everyone loved it.